GM picked the Los Angeles show today to launch its redesigned GMC Yukon XL and Chevrolet Suburban SUVs — the latest of its GMT-900 full-sized trucks for 2007 to break cover. If the press releases give any indication, the Yukon is the slick, powerful one and the Suburban is its safer than milk counterpart, with a "360-degree perimeter safety system" that includes roof-mounted head curtain side air bags with rollover protection, front-seat safety belt pretensioners and traction control. We love marketing. Click through for more pics. 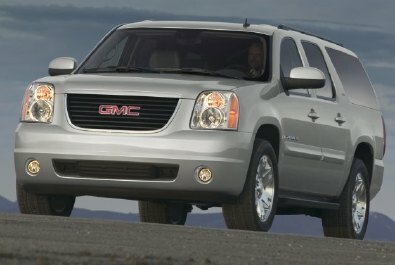 Yukon XL and Yukon XL Denali become available in the second quarter of 2006. The XL models have exterior dimensions similar to the regular models, but are about 14 inches (355.6 mm) longer in wheelbase and 20 inches (508 mm) longer in overall length. Yukon XL is available in SLE (cloth trim) and SLT trim (leather appointments), as well as 2WD and 4WD configurations and a heavy-duty model. A third-row seat is standard. A 5.3L V-8 with Active Fuel Management displacement on demand fuel-saving technology is standard. Later in the model year, a new 6.0L all-aluminum V-8 with Active Fuel Management and variable valve timing (VVT) becomes available; a 6.0L V-8 with VVT is offered in heavy-duty models. 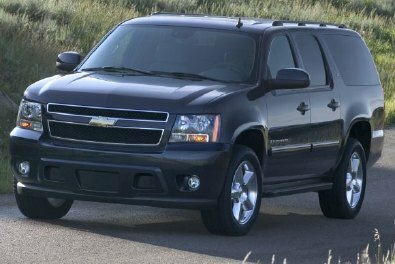 The 2007 Suburban is available in the second quarter of 2006. It is offered in LS, LT and LTZ models, with 2WD and 4WD (a Z71 off-road package will be offered later in the model year), as well as 1500 and heavy-duty 2500 series. At the start of production, Suburban 1500 models will come with an efficient 5.3L V-8 with Active Fuel Management displacement on demand fuel-saving technology. Later, a new, all-aluminum 6.0L V-8 with Active Fuel Management displacement on demand and variable valve timing (VVT) will be available. A 6.0L engine with VVT and an iron cylinder block is offered on 2500 models.